← KUDOS FOR “GHOST LIGHT” ON FAMOUS MONSTERS OF FILMLAND! It’s Halloween weekend. This means there will be parties and probably some trick or treating, especially if you have children. Which means that on November 1, if you’re like many people, you’re going to have Halloween treats hanging around your house tempting you for at least a week. If you’re on a diet, this can make things stressful. But there’s no law that says you can’t have one piece of candy a day. And sometimes it helps keep you on track. 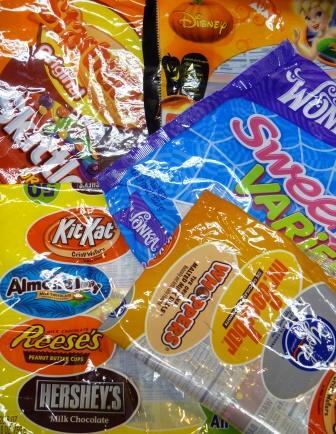 So, here are some popular Halloween treats (mostly, the kinds that get sold in those giant bags at Wal-mart) and their calorie counts. Calories are for one piece. Remember, these are the tiny ones that come in the bags (usually referred to as “mini” or “fun size”)! All values were taken directly off the product packaging and were divided for single wrapped pieces. Posted on October 30, 2010, in Deep Thoughts & Fun Stuff and tagged Calories, Candy, Diet, Halloween. Bookmark the permalink. 2 Comments. Oh no! That’s not good news! It probably isn’t if you’re like me, who one day did the math and figured out she’d eaten close to 3500 calories worth of Snickers! YIPES!